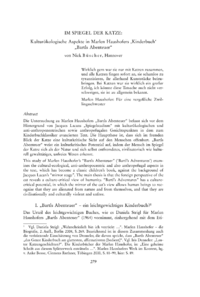 This study of Marlen Haushofers Bartls Abenteuer (Bartls Adventures) examines the cultural-ecological, anti-anthropocentric and also anthropofugal aspects in the text, which has become a classic childrens book, against the background of Jacques Lacans mirror stage. The main thesis is that the foreign perspective of the cat reveals a culture-critical view of humanity. Bartls Adventures has a culturecritical potential, in which the mirror of the cats view allows human beings to recognise that they are alienated from nature and from themselves, and that they are civilisationally and culturally violent and unfree.